Imagine this scenario. Your flagship product is doing OK; you’re getting downloads. Nevertheless, increasing sales is always a top priority, so you decide to create a free OSS version to boost usage and generate more awareness in the market. It’s also a great product, free to download, and is a great teaser for the upsell to your commercial version. So you upload the OSS version to your organization’s public repository on Bintray. After a while, you check its stats and are delighted to see thousands of downloads, and yet, there’s no buzz. If so many people are downloading your package, why is nobody talking about it? After checking your logs, you discover that most of those downloads you were so happy about are from the same set of IP addresses. Someone is reverse-spamming you, and you need to block them. Geo-Restriction could do the job, but then you don’t want to restrict whole countries at a time. You need something more targeted. 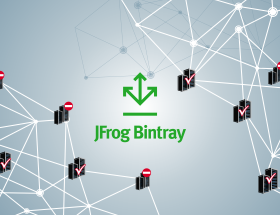 Bintray’s new capability for IP restriction will do the job. IP restriction is very similar to geo-restriction, only instead of defining your whitelist and blacklist as countries, you define them as a range of IP addresses using CIDRs. This gives you much more control letting you allow or block download at any level of granularity down to a single specific IP address. Whatever IP those bots are operating from can now be easily blocked so you can get the real download statistics you were interested in. 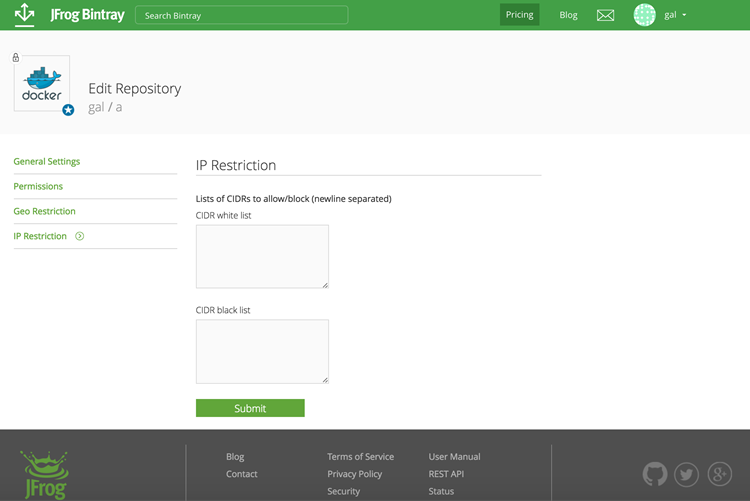 You can define your CIDR whitelist and blacklist through Bintray’s REST API or in the Edit Repository page. Note that if there are any overlapping IPs, (i.e. IP addresses that are included in CIDRs that are in both the whitelist and the blacklist), then blacklisting them takes precedence. And if you accidentally list the exact same CIDR in both the whitelist AND the blacklist, Bintray will catch that and issue an error. Ready to use IP restrictions? Get a quote for an enterprise account and ask for a free trial.